Chapters From My Life: For who can we choose death???? I was pondering on who can choose death question because I have been troubled with the question at times… Death is fact and I have come to accept it. No one can escape and no one can change it. It hurts to loose someone dear to us but we have to learn to live with this fact that it is inevitable. When death comes naturally we are helpless and can do nothing much .. nothing can stop it. It is the choice of death over life that has always confused me. At times people argue that certain person has no life and there is no use prolonging their suffering, therefore it should end. Sometimes it is the person who is danger to the society and there fore given death sentence. These are the situations which makes me wonder what if the miracle was on way. So many times we hear people going through miraculous changes and recoveries. I have had my share of traumatic situations in my life where the question has stood before me. My sister going through cancer did not go for suicide, that was cowardly for her and she knew how much her family loved her. She would not hurt them. But she chose not to go for treatment. Nothing at all. I had to watch cancer slowly creep and establish itself and finally one day snuffing off her life. Our family has never been same again. My mom and dad were devastated and they were left with a bigger pain then cancer would ever give them. I was diagnosed with the same breast cancer a little later and it was when my sister was in last stages of her fight with cancer and I could see she was losing the battle. She was a wreck after knowing my diagnosis and worried for my children. It was ok for her to die but not for me because I had the responsibilities of children. I at times wonder if she had children would she make a better choice. Was the choice she made the right one? Do we have any right to stop people from dying if they want to? I assured my sister and my family that I am not going to give up. Just watch and learn I told them… I fought hard making safer decisions. Instead of going for just removal of tumor and preservation of breast, I decided to go for total radical mastectomy which was tough decision at 29. I am still here wondering about making choices. My sister was emotional wreck and did not live to see my recovery from cancer. I have always been troubled with the thought whether I should have done more… I know I tried various methods of convincing my sister. But it was just persistent words. Did I have power to stop her and did not? I know when my sister decides on something nothing could make her change her mind. Be it taking care of pet, helping someone in need, or taking someone to task. She gave it all… always. Everyday I live and see the world, I feel guilty that I watched my sister die of breast cancer which I have survived. When I was pregnant with my daughter, I had complications in the 3rd month and almost lost her. I had bleeding and it looked like a miscarriage. But she was determined to stay so she did with the help of doctors. My family and most of my friends were worried that the child would be born with disabilities and therefore it would be good if I go for abortion and try having child some other time. I was young and could always try to have more kids they argued I could not do it. I had seen the baby on the scanner and I had seen the life. For nothing in this world could I kill it. Doctors assured me that the baby is healthy and shows no sign of abnormality in growth or anything at all. What if they had diagnosed that she would be born with special needs? Would I have changed my decision to go ahead with pregnancy? I am damn sure no. I could not imagine snuffing a life out of a child who was supposed to be protected in my womb. I was supposed to give life and take care of this baby. I went through lot of pressure but had enough guts to repel it and go ahead and give birth to my daughter. She was beautiful and healthy. Doctors said “we said so” and I was happy. After two months when she was diagnosed with brain atrophy and developmental problems everyone else said “we said so”. I was accused of making her suffer when I had choice of stopping it. After initial shock, I had time to sit and think and once again felt I wanted her and my decision was right. I told the naysayers that they still have a chance of killing this wonderful baby. The baby was the same before and now. Only size had changed and if we really wanted to kill her we can do it now. But if we had killed her in my womb we could never give her back the life again. That shut them up and everyone knew that even giving my child a dirty look would be dangerous. All knew how fiercely I loved her. Yeah ! No matter what she is I love my child and I am willing to stand up and fight the battle with her. That was not a big sacrificial statement because no one could resist loving this beautiful baby. She will have life, may be different from us but she will have it. As I have continued with life I have come up lots of questions regarding who should live and who should not… the question will never have an answer and will remain unsolved puzzle for ever. Every person who says I have made a wrong decision or right decision will leave a mark in my heart. Some hurts .. some comforts. I am absolutely sure I have made the right choice with my daughter. But when it comes to my sister I am still at loss… I miss her so much even to this day. No one can choose it, I don't think this decision is ours to make. Even in the throes of painful suffering and hopelessness of cure, medicine can delay it but ultimately the choice has already been made for the dying person. Life is a gift, it is not ours to take and we should do the utmost to live it as best as possible as long as we have it. That 'best' is defined in many ways. As to why many die before their time, only the Almighty knows that answer. The same thought I come up with is that they had fulfilled their purpose on earth. That purpose was to touch one or others around them in some positive way to lead them on the right way. When I think of little Jeremiah, I think it was a test of faith for his parents who have come through their tragedy much stronger in their faith and more appreciative of life and for the lives of the 2 boys they have. It seems to me that we all have to suffer somehow in this life to appreciate true worth or to see a higher purpose and for little Jeremiah - his syndrome was his suffering for a few months and that his purpose for his family was that. Farila, you are one of the strongest people that I have ever met. As well as knowing you for such a long time, I know that you are also one of the stubbornest people that I have ever met too! For that, I totally admire you. You have a way of putting your point across that is hard to beat! You have two beautiful children, and I know that you will always put them first before everything else, even risking your life for your daughter. Yes, no one said that life would be easy, but we do all we can to get through it as best as we can. I don't know what I would do if I was faced with the choice of euthanasia, it's not the taboo subject that it once was, but I do know that I would prolong life for as long as I possibly could. You know that you made the right choice in the case of your own health for the sake of your daughter, and she will always be loved. Your sister was a totally different case, and I think that you can only do what you think is right at the time, but the chance was there for her. I don't know the reasons why she chose the option that she did, but I am so glad that you did! For me I would choose life but I can only make that choice for me!! Also, that is my feeling today...who knows how I will feel if I were in the same situation as your sister. This was a beautiful post! You have a good head on your shoulders. And you reason and think things through. Disease strikes some and passes others by. Who knows why? Your sister made her own decision based on what she wanted. Even though you had good intentions and did what you felt you could, she still was responsible for her life and the choices she made. And you made your own choices as well when the same disease came your way. Each must decide. I stand your ground with you on choosing life for your daughter. Who else will stand up for the rights of an unborn child if the mother won't. I commend you. And just look at her now. You know you did the right thing. These are always very difficult dicisions in life, I prefer to thinkt hat whatever we take, its destiny and god decides for us. You really are a strong woman, your kids would be so proud of you. I'm sorry you lost your sister, but I suppose she just didn't have your strength. I'm told by my mother that sometimes she just wante to give up because of the pain, but then she'd think about my siblings and I and she'd understand that she couldn't abandon us. Perhaps its a mother's instinct because you know how much your kids need you. Either way, everything will turn out fine and I pray your sister's soul rests in peace. Thank you Gayle and I am so glad you have same opinion like me..
Matty - You have been very understanding and given me lot of insight in this dilemma .. It means a lot to me. I am so grateful to you. Antarman - God has given the power of decisions to us. Fierce- I am new to your blog and do not know much about your mother. I am sorry she is going through pain and I am sending my prayers to her. You are right.. it is a Mom thing. We cannot die peacefully until our kids are safe and secure. Thank you Shreya It was nice comment. It is always hard to lose someone you love, no matter how old or young. My 92-year-old grandmother died this past week; she basically wasted away after a lengthy illness and it was very difficult to watch. I think the choice your sister made was her own decision and you should not feel any guilt about it. Also, you made a very beautiful, brave choice with your daughter and you should feel proud. I am certain she is very precious to everyone who knows her (and to God) and she is blessed to have a mother who will stand up for her as you did. I am so sorry people tried to make you feel guilty for having your daughter. Now I understand what you were saying about disability and acceptance before. Why assume your daughter suffers? Because she has cognitive difficulties? I am sure she has a hard time with life, but I'm sure she also has a lot of happiness. And probably one of the most difficult things your daughter faces and will face is nastiness and judgment from others. So should we abort all disabled babies to avoid cruel people? just two words for you..."HATS OFF"
you have really been through a lot.. and I admire your decision to stand up for yourself and that little unexplored life inside you. She is really lucky to have a mother like you and I am sure its vice versa. I am really sorry about your sister...but you know life is too short for regrets. It was just meant to happen...so now see it this way....that your sisters now lives inside your daughter. She never went anywhere...she is always with you showering her love in the form of this little angel. God bless you and your sweet family..!! How blessed your children are to have you as their Mother. My niece is 17 and has special needs too. She looks like every other girl her age, but she has difficulty with fine and some gross motor skills, does not perceive depth, abstract thinking/problem solving and picking up social cues. She is loving and a wonderful and I can't imagine the world without her. She is the daughter of my beloved older sister. Which leads me to saying I am so sorry about the tragedy of losing your sister to cancer. She made the choice the felt right to her heart, it was her souls path...like you have chosen your souls path (as much as we humans can choose). May God bless you and your sweet family. I'm so happy to have stopped by to read a bit of your blog this morning. Oh Farida yours is a heart wrenching story..I feelone with your loss because I lost my mum too in 2003 when I was just a teenager and her absence can never be made up for! I pray your loved ones rest in peace..
And let me tell you..your writing speaks a lot about what a beautiful human being yo are..Im sure you make a wonderful, loving, caring and a wise mother! What more does ur daughter want? Loved this post. 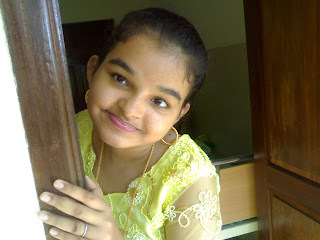 My highest regards to you and lots of love to Farheena.